Peanuts (or groundnuts) are widely used as a food by Africans as they are a major source of protein. The productivity of peanut in Africa is very low which is particularly attributed to foliar diseases. 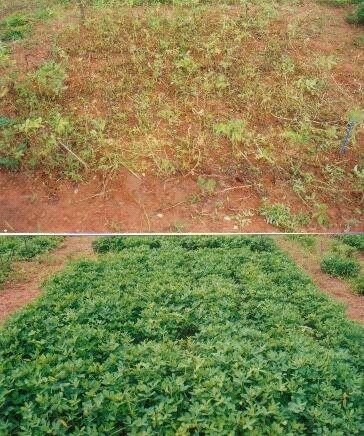 Disease severities are so high in Africa that at harvest 80% of the leaves on peanut plants are defoliated. Research has shown that application of fungicides can successfully control diseases of peanuts in Africa and lead to substantial increases in yield. Farmers usually attribute leaf defoliation to maturing of the crop, and yield loss from foliar diseases is not recognized. Fungicide use is not a common practice in developing countries of this region partly because of lack of resources and lack of awareness of the extent of economic and yield benefits from application of fungicide. Data on yield benefits under on-farm studies should be quantified to bring awareness to agricultural communities, and to improve access to capital resources to demonstrate that fungicide application can be economically viable with greater returns. The objectives of our research were to quantify yield losses due to disease and to demonstrate the influence of fungicides and SSP fertilizer application on severity of leaf spot, dry matter production and pod yield of peanut crops grown in on-station and on-farm conditions in Northern Ghana, which is representative of the important peanut producing regions of West Africa. Applications of fungicide were effective in controlling leaf spot and improved peanut pod yield on average by 48% in the three tested village sites under on-farm conditions and by about 40% under on-station conditions at two sites. Authors: Naab, J. B., et al. Source: Peanut Science. 2009. 36:157-164. This entry was posted in Fungicides and tagged Africa, foliar diseases, fungicides, groundnuts, peanuts, protien by pesticide guy. Bookmark the permalink.